The gun-loving rocker claimed gun control laws were a Jewish conspiracy and then called Holocaust victims "soulless sheep." 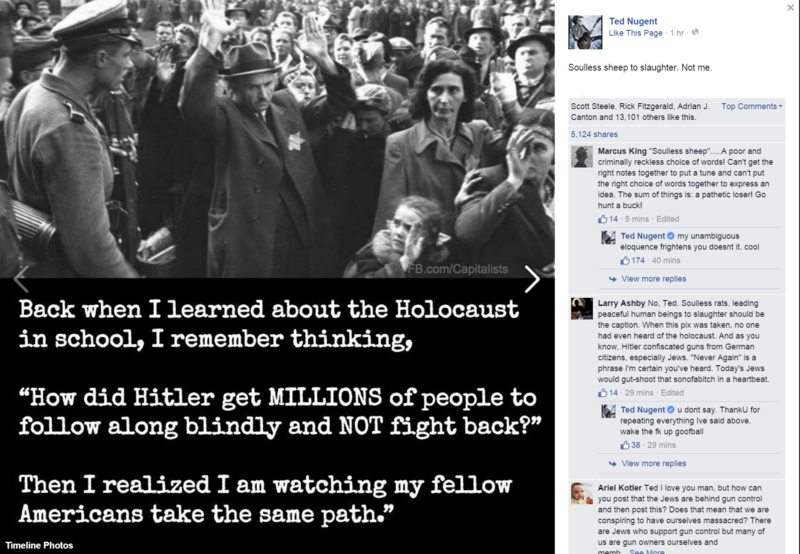 After sticking to mostly dog-whistling over the past few years, over-the-hill rocker turned conservative commentator Ted Nugent went full Stormfront on Monday by posting anti-Semitic images and rants to his Facebook page. The Nuge was attempting to make the case that efforts to enact gun safety laws in this country were all a part of a Jewish conspiracy to take away Americans’ firearms. All he really did was expose the fact that he truly is a white nationalist. Nugent began trending on social media Monday afternoon when he plucked this image from the depths of the white supremacy sewer. Notice how Michael Bloomberg is referred to as “Jew York City mayor,” Chuck Schumer is called “Chucky boy” and deceased Senator Frank Lautenberg is criticized for giving “Russian Jew immigrants” money. The image was accompanied by a trademark Nuge rant where he chastised all the freedom haters for trying to take away our guns. 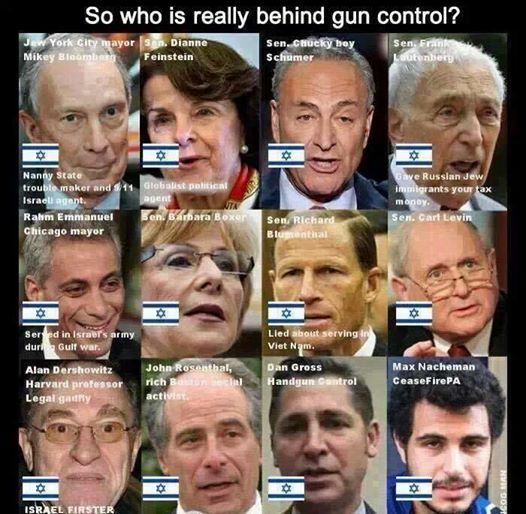 As first reported by Media Matters, this image was posted to the racist message board Stormfront in 2014 during a conversation about Jews using the “holohoax” to push their insidious gun control measures. Because, as we all know, Jews want to control the entire world. Throughout the day on Monday, the ‘alt-right’ crowd began expressing their support for Nugent, claiming he was just speaking the truth and pulling the veil off the whole conspiracy. Interestingly, many of these users are Donald Trump supporters who also claim there is a ‘white genocide’ currently under way. More concerning is the fact that some of these users have thousands of followers, showing that they aren’t nearly as ‘fringe’ as we would hope. He even got a mention from former KKK leader David Duke. It should be noted that Nugent is a board member of the NRA. Apparently, blatant anti-Semitism is cool with them.